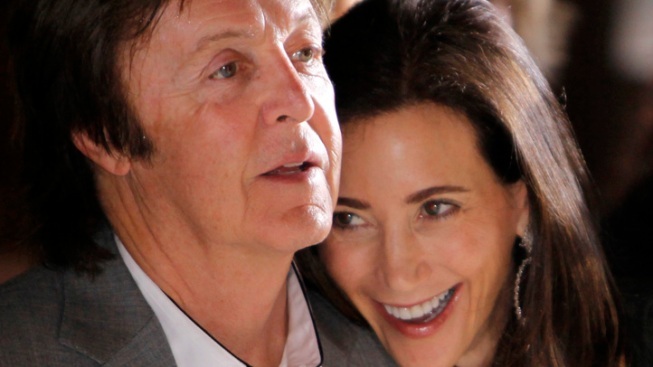 Former Beatles, Paul McCartney and his fiance Nancy Shevell posted a notice of intention to marry at London's Marylebone Register Office. Paul McCartney plans to wed sometime within the next 16 days, according to papers he filed in London. McCartney, who is engaged to New York businesswoman Nancy Shevell, posted wedding banns at the Westminster Register Office in Marylebone, London, this week. The banns allow him to wed within the next 16 days. The former Beatle, 69, began dating Shevell, 18 years his junior, after his acrimonious soplit with Heather Mills, his second wife. The banns list the couple as "James Paul McCartney" and "Nancy Shevell" and say he has had a previous marriage dissolved. McCartney was married for 29 years to Linda Eastman until her death of breast cancer in 1998. tied the knot at the same register office on March 12, 1969, and were greeted by hundreds of fans. But the six-year marriage to Mills ended badly. They wed in 2002 at a lavish, $3.2 million ceremony at Castle Leslie, in Ireland. But four years later they separated and she eventually walked away with a $50 million settlement. McCartney has five children -- four from his marriage to Eastman, and one from his union with Mills. Shevell has a teenage daughter.